The site to the south-east of the pub in Longhorsley where 55 homes are proposed. 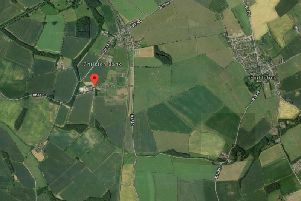 A development of 55 homes is now being taken forward in a Northumberland village, on a site which was granted outline permission four years ago. Partner Investments Ltd’s outline bid for up to 55 properties on land south-east of the Shoulder of Mutton pub in Longhorsley was approved by councillors back in June 2015. It was given the nod at the same meeting as Cussins’ 25-home Wilding Grove development on the northern edge of the village. Now, Calmont Developments has submitted a reserved-matters application to Northumberland County Council for the 55 houses, seeking permission for the design, layout, scale, landscaping and access. Following the outline approval, the site was included in the village’s housing allocation in both the Longhorsley Neighbourhood Plan and the emerging Northumberland Local Plan. ‘The overarching vision is to deliver a sensitively designed and high-quality residential environment that meets demand for market and affordable dwellings in Longhorsley’, a planning statement says. It is proposed to build eight two-bedroom, semi-detached bungalows, six two-bedroom homes, two three-bedroom houses, 32 four-bedroom properties and seven five-bedroom dwellings, with a variety of house types. Access would be provided by a new priority junction, incorporating a ghost right-turn lane, off the A697 into the south-west corner of the site, which will form a stagger with Church View. There would be another entrance to the north-west corner, connecting to the village centre, but this is only for pedestrians. Parking spaces would be provided based on the county council’s guidelines – two spaces for two and three-bed houses, three spaces for four and five-bed properties and one visitor space for every four units. The application also explains that, in line with the outline permission, there would be a number of different ‘character areas’, such as North East Court – eight homes of varying size and height arranged around an open area of shared surface, and Western Mews, which includes a path for pedestrians to move between the village/north of the site and the bus stop/south of the village. There will also be a run of four terraced cottages along the northern edge of the site as ‘a contemporary take on pit cottages or a run of alms housing traditionally found in rural settings’, as well as a central green.